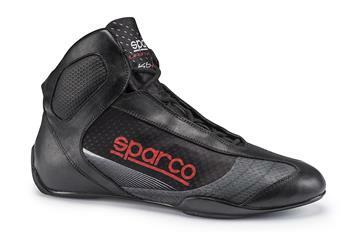 Superleggera KB-10 kart boots offer a high-tech solution from innovation and materials. COMPOSITION: the Superleggera KB-10 uppers are made from a breathable pressed fabric with scuff resistant injected moulded TPU. The TPU is injection moulded on the fabric to avoid the use of stitching. Leather reinforcements. Hell protector in padded scuff resistant 3D material. Internal laces. Insoles. Superleggera KB-10.1 racing boots have an elasticised panel at the rear just above the heel to improve fit and allow the ankle to move freely when driving. Light asymmetrical soles with integrated external reinforcement for the area most affected by wear from using the pedals.